A talk by Dr. Jeremy Matthew Glick, Associate Professor of African Diaspora Literature and Modern Drama, Hunter College, City, University of New York. 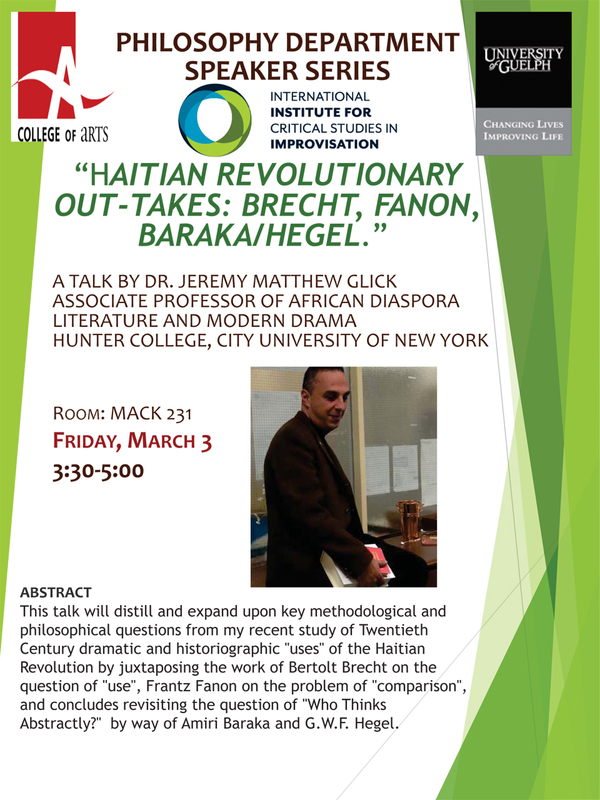 This talk will distill and expand upon key methodological and philosophical questions from Dr. Jeremy Matthew Glick’s recent study of Twentieth Century dramatic and historiographic “uses” of the Haitian Revolution by juxtaposing the work of Bertolt Brecht on the question of “use”, Frantz Fanon on the problem of “comparison”, and will conclude by revisiting the question of “Who Thinks Abstractly?” by way of Amiri Baraka and G.W.F. Hegel.